One thing the internet both rewards and hates at the same time is when someone reposts something, without crediting the source, as their own fresh content, under an alias. Reddit has an entire culture revolving around it. Copyright defenders try to point out that just because something’s on the internet doesn’t mean it’s free, but it falls on deaf ears at every corner. People use aliases to cover up their duplication, with little regard to taking much claim of their stolen content, other than to reap the attention, upvotes, and thumbs-ups in the fallout. 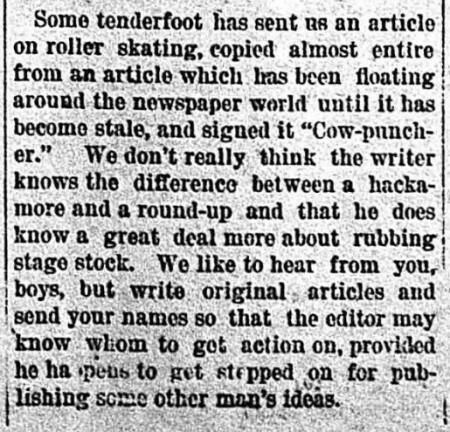 Some tenderfoot has sent us an article on roller skating, copied almost entire from an article which has been floating around the newspaper world until it has become stale, and signed it “Cow-puncher.” We don’t really think the writer knows the difference between a hackamore and a round-up and that he does know a great deal more about rubbing stage stock. We like to hear from you, boys, but write original articles and send your names so that the editor may know whom to get action on, provided he happens to get stepped on for publishing some other man’s ideas. I couldn’t figure out what “rubbing stage stock” meant, but it must be an uncowboylike task the way it was accused upon the alias-hidden copyright-infringer. You are currently browsing the The Infomercantile blog archives for March, 2017.